If you’re working on your bike, even if just doing mild maintenance, you need to be aware of torque. 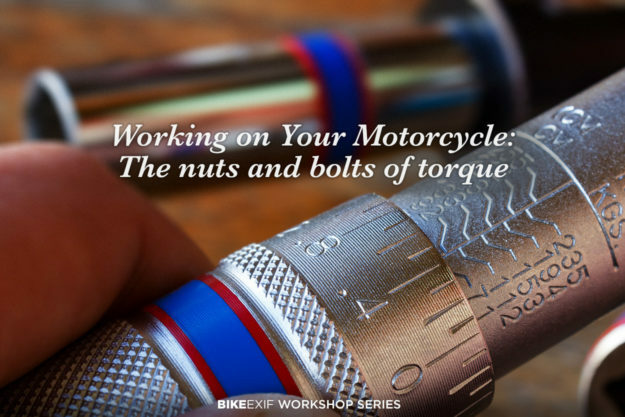 It isn’t only the thrill you get when you open the throttle and your bike surges forward—it’s also the rotating force you apply when you’re tightening a bolt, whether it’s an oil drain plug or an axle nut. What is torque? Loosely speaking, torque is simply the application of a force, some distance from an axis, to create a twisting action. 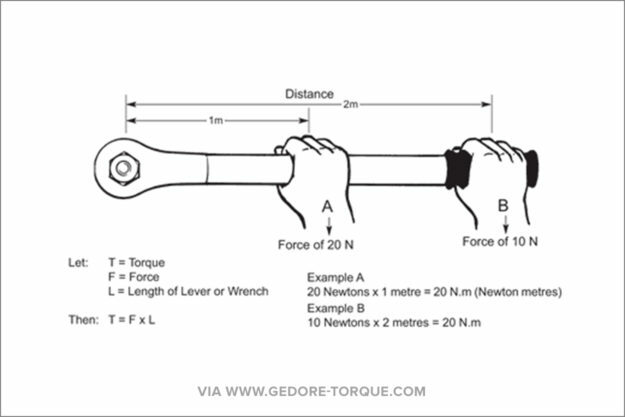 As the diagram below shows, if I double the length of the wrench, I can get the same torque at the bolt by halving the force. It’s measured in units that relate to the lever arm length and the force applied at a particular distance. On the imperial scale, torque is measured in pounds-force-feet (lbf ft)—but often listed as ‘ft.-lb.’—and on the metric scale, it’s measured in newton meters. This is an important concept, for not just bolts and nuts and other fasteners on your motorcycle, but also concepts like acceleration. To start with, we just need to understand the relationship between this lever arm length and the force that you apply at the end of it. Why is torque important? Well, we need to go back a few steps. Bolts are used to clamp parts together. 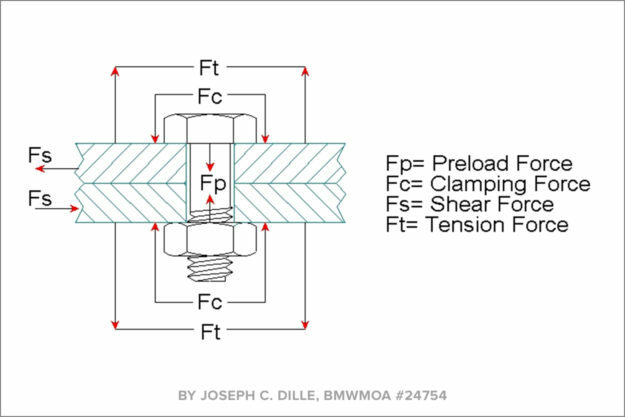 The size and type of bolts on a bike depend on the expected stress they’ll see in service: Engineers have determined through calculation, testing or simulation what sort of forces might act on the joint. For example, the bolts that hold your cylinder head onto the cylinders have to withstand the pressure from the controlled explosions happening in the cylinder. Bolted joints work by clamping the parts together very tightly. Once they’re clamped together, friction between the parts makes them difficult to slide apart and the bolt acts like a spring. If we bolt two parts together, the bolt will stretch as the nut is tightened. 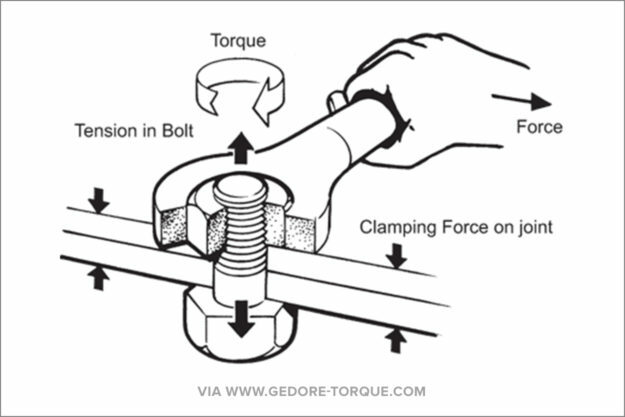 As the bolt is stretched, an equal and opposite clamping force acts on the parts. On the small bolts found on your motorcycle, it’s not difficult to ‘overtighten’ or even break bolts. If you pull on a spring, you can pull it so far that eventually it will deform, and not return to its original shape. Bolts are no different. When you tighten a nut, or a bolt that goes into a threaded hole, you are stretching the bolt. If you continue to tighten, the bolt stretches and stretches, and eventually goes past its ‘elastic limit.’ It won’t spring back to its original shape. In some specific applications, bolts are tightened into this range. Often the service manual will instruct you to replace bolts that have been tightened in this manner, but this is more commonly seen in heavy duty applications, like trucking and mining equipment. Once the bolt passes the elastic limit it will break if it continues to be tightened. If the bolt is too loose, the joint will be loose, and it will move when it is used. This is a bad outcome, as you can imagine. In practice, there’ll be a recommendation in your bike’s service manual that specifies the torque to use on that bolt in that particular assembly, and it’s been determined by an engineer through the design and testing of that assembly. What is a torque Wrench? To tighten the bolt to the specified torque, you need a tool called a torque wrench. 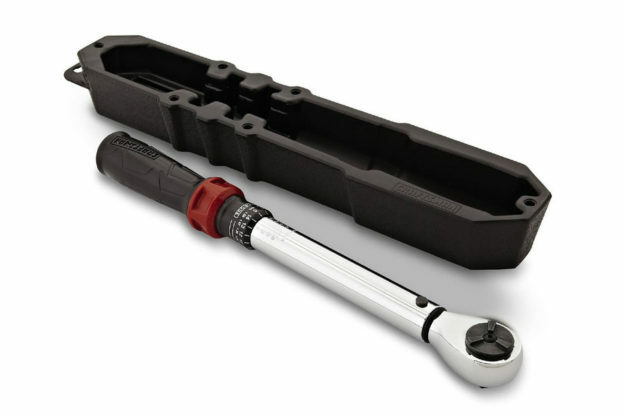 There are a variety of torque wrenches available, but we’ll just focus on the commonly available ‘click-type’ wrench (like the Craftsman model shown above) that you’ll find in retail automotive shops, or via online tool vendors. Similar to your first wrenches, I would suggest a 3/8″ drive torque wrench. That should be fine for motorcycle work, and will be compatible with the socket wrench set you might buy. Torque scale Modern click-type torque wrenches are adjustable for a range of torque values. You can adjust the scale for the torque you wish to achieve at the socket end. Once you reach that value, it will make a loud click to tell you that you’ve reached the desired torque. If you are reusing a bolt, clean old dirt, grease and paint off the threads first. 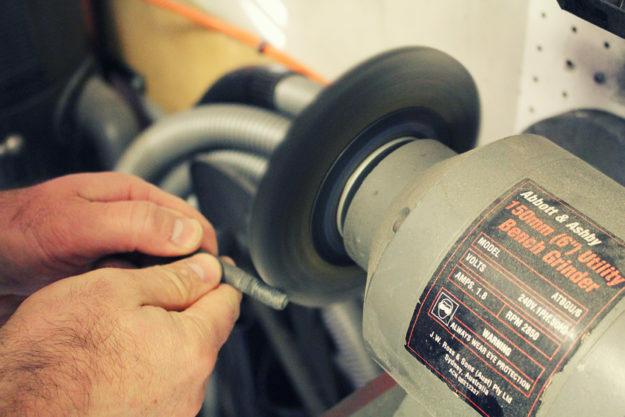 A bench grinder with a wire wheel is ideal for this. Alternatively, clamp the bolt head in a vice with the threads pointing up, and use an angle grinder with a wire wheel. At worst, use some kerosene, or WD-40 to loosen deposits, and brush off any deposits with a wire hand brush. 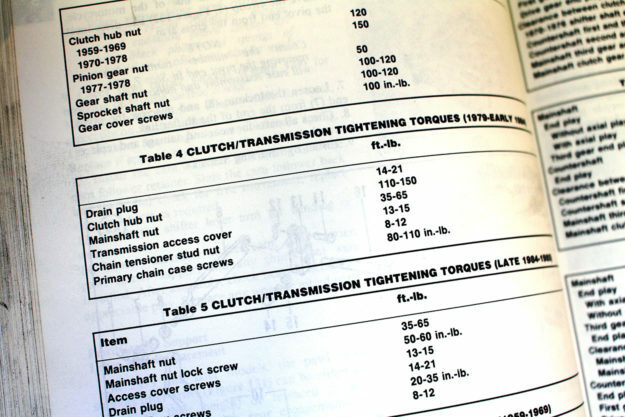 Find your service manual Get the correct torque value from the service manual. If the units differ between your wrench and the service manual, use the Norbar app to convert the units. Check the instructions in the service manual. Is the bolt supposed to be dry, or lubricated? Lubrication will allow the bolt to stretch further before reaching the torque wrench setting. 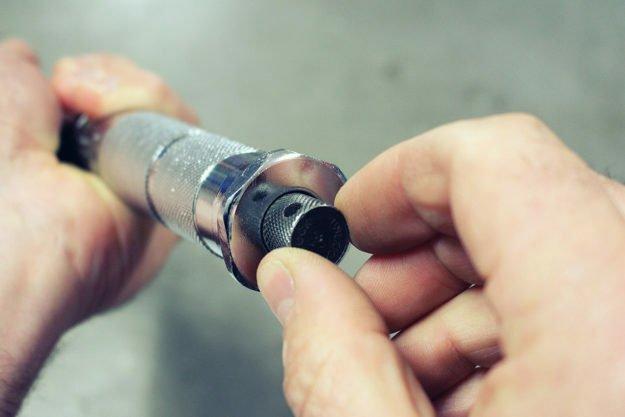 Install the bolt and tighten it down by hand or with another wrench until it is ‘snug.’ Select the correct-sized socket to suit the bolt or nut and install it onto your torque wrench. Then loosen the small locking nut at the bottom of the wrench handle. Inspect the scale on the side of the wrench to determine where your desired torque value is located. 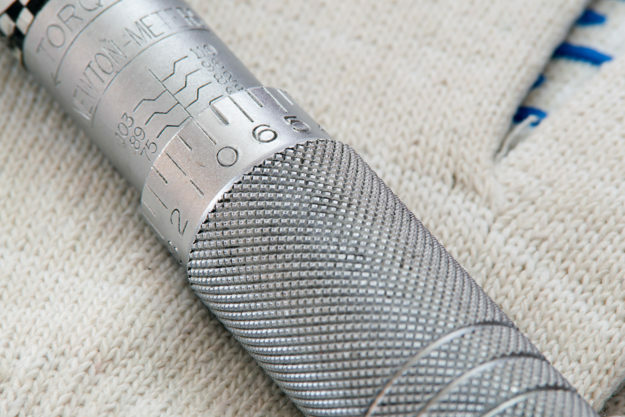 To adjust the torque value, twist the handle and screw the graduated edge of the collar up to your desired value. Hand-tighten the small locking nut at the bottom of the wrench handle. Then use the torque wrench to tighten the bolt to the desired torque. Apply smooth movement to the wrench until you hear a loud ‘click.’ Stop pulling on the wrench immediately: You have reached the desired torque. Loosen the small locking nut at the bottom of the wrench handle. Unscrew the handle and re-set at the lowest value. Care and storage of your torque wrench Click-type wrenches contain a spring in the handle to operate the mechanism. When you turn the handle to increase the setting of the wrench, you are putting a pre-load on the spring. So it’s good practice to loosen off the adjusting mechanism, as mentioned above. This reduces the chance the spring will take a set while under tension as it sits in your toolbox for six months. A torque wrench is generally considered to be a precision instrument, so don’t drop it, or use it as a socket wrench for everyday repairs. If you are working in a quality-approved organization, wrenches would be calibrated on a regular schedule to ensure they are accurate. While researching some details for this article, I found a couple of useful articles showing how to calibrate a torque wrench in your own shop. One is listed below. This might not pass muster if you were repairing a Boeing 787, but would be adequate for most custom bike repairs. Finally, letting your torque wrench roll around loose in your tool box is probably not going to help it. Most wrenches are supplied in a plastic case, and I keep mine in the case supplied. Worst case, just keep them somewhere where they’ll avoid knocks.